Looking to impress your friends or have the kids control movie night without needing 15 remotes? We’ve tested the easiest way to make your own home theater using connected devices and a touch of voice control. Check out the easiest way to DIY your own movie-viewing party, depending on the voice control you’d want to use. If you visited Pulaukotok’s Smart Cottage at our Celebration Weekend event, we demonstrated the power of entertaining by pairing Logitech’s Harmony Hub () with Amazon Echo’s voice control. The Logitech Harmony Hub can control almost any everyday television (not just smart TVs) and streaming players like the Roku stick or Apple TV to instantly turn on and transport you to what you want to watch. You’ll start by installing the hub in your living room, and then sync it to other entertainment-related devices in your home using the app. For example an Amazon Echo, your streaming device, and the TV. Next, if you have them in your living room, make sure to connect smart light bulbs to the hub. After you’ve added all the devices to your hub via the app, you can create “Activities.” An Activity is a singular command that triggers multiple things in sequence. In our Smart Cottage, we demonstrated an Activity called “Watch TV.” In it, our TV turned on, the Roku switched to our Amazon Prime Video, the smart lights dimmed, and our previously-on SONOS speaker switched off, prepping the living room for a show or movie to begin. And, when we ended the Activity, the lights turned back to normal and the TV switched off. In setting up your own Activities, you’ll choose the devices you want in the Activity, what you want them to do when it starts, and what you want to happen when it ends. Build the Activity in the app first—but don’t add Alexa to it directly. Instead, once you’re done creating the Activity, open up your Alexa app and activate the Harmony Skill. Once you do that, your Alexa will automatically learn your Activities and their names, so that you can say “Alexa, turn on Watch TV” and the series of events you set up will occur. Pro tip: If you’ve got smart outlets and a popcorn machine, hook it up to start popping when you ask to watch TV! Make sure you’ve got the kernels in the machine beforehand, though. 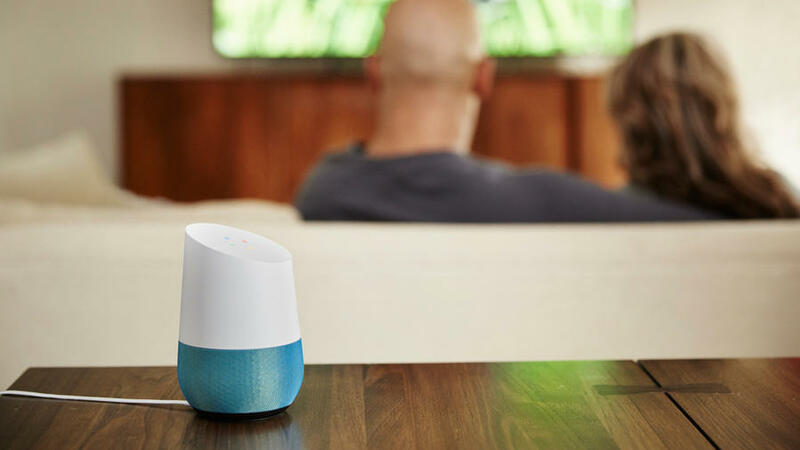 If you’re a Google Home user, you have two options for a smart home theater: 1) Get a Logitech Harmony Hub and follow the above steps, as the hub also works with Google Home, or 2) Get a few Chromecast devices to take over your TV and any speakers in your home. A regular Chromecast will control what’s streaming on your TV, while Chromecast Audio can control nearly all the speakers in your home (notably SONOS isn’t compatible). Once you have a Chromecast on your TV and a Google Home installed, you can activate a long command to show the video content of your choosing. If you want to watch Zootopia, for example, you’d need to say “OK Google, turn on Zootopia on Netflix on my Chromecast.” You can give your Chromecast a shorter name, but the best way to expedite these commands is to create shortcuts within the Home app. These shortcuts would be for singular tasks, unlike Logitech’s singular Activity that encompasses several, but they still work well. For example, you can set up “Movie Lights” in your living room by creating a task that sets all the lights at 25% brightness; all you’d have to say is “OK Google, Movie Lights” to activate it (instead of “OK Google, dim my living room lights to 25%”). You can also create shortcuts for specific video content, such as one called “Moonrise” to start Moonrise Kingdom on Netflix, or “Winter is Coming” to start Game of Thrones on HBO Now. It’s an à la carte system, requiring you to make shortcuts for shows or movies you’d like to easily access, but building shortcuts takes mere seconds in the app, which is faster than building a custom Activity in the Harmony Hub. Pro tip: Use Chromecast and Chromecast Audio to create instant surround sound with the speakers you already have in your home. If you’re an Apple TV user and want to control a smart theater through your iPhone (or are holding out for a HomePod), taking advantage of Homekit Scenes is the best way to go. Within the iPhone Home app, click the plus button in the upper right-hand corner and then add the devices in your home by clicking “Accessory.” Once your devices are all added, click that same right-hand corner and select “Add Scene” to customize a command for them to follow. You can create a unique name and the setting it’ll trigger, like “Movie Time” to dim the lights. You’ll be able to browse existing settings on the last page of the Control Center menu, or simply ask Siri for them. Then, just switch on your Apple TV and use the Siri remote to voice-control your way to a huge variety of apps, movies, and shows. You don’t have to request specific content, either; you can ask Siri for something funny, movies with Harrison Ford, and anything else to suit your mood or tastes and you’ll get a variety of choices that pull from streaming apps and the Apple Store. The tricky thing with Homekit is its limited number of compatible devices. Philips Hue lighting is a safe choice, and Elgato Eve has Homekit-compatible smart outlets and light switches, so you can control lights or other devices that aren’t smart to begin with. But Apple is rolling out more and more partnerships within Homekit, and with HomePod on its way, there are sure to be additional options in store. Pro tip: You can also use Apple TV with a Logitech Harmony Hub, so the $99 device is a safe bet to start with no matter what device you already have in your home.